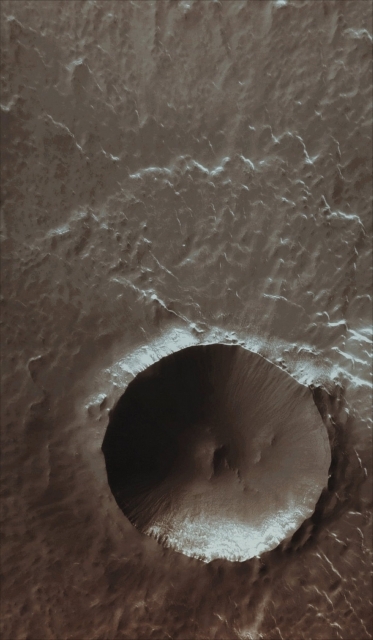 In this accurate Extra Detail Maginfication (or "EDM", for short) of yesterday's VIS image, taken by the NASA - Mars Odyssey Orbiter on December, 5h, 2015, and during its 61.992nd orbit around the Red Planet, we can see very well Lonar Crater. This is a fairly pristine (---> meaning almost intact) Northern Impact Crater, with (double) Pedestal, steep and flat Slopes, Ice (most likely, Water Ice) on its North-Facing Inner and Outer Slopes and some deposition of Material (Sand maybe?) on the Floor. This image (which is a crop obtained from an Original Mars Odyssey Orbiter b/w and Map-Projected frame published on the NASA - Planetary Photojournal with the ID n. PIA 20257) has been additionally processed, magnified to aid the visibility of the details, extra-contrast enhanced and sharpened, Gamma corrected and then colorized in Absolute Natural Colors (such as the colors that a normal human eye would actually perceive if someone were onboard the NASA - Mars Odyssey Orbiter and then looked down, towards the Surface of Mars), by using an original technique created - and, in time, dramatically improved - by the Lunar Explorer Italia Team.